By Allison Graves, Jon Greenberg, Louis Jacobson, John Kruzel, Katie Sanders, Amy Sherman, Manuela Tobias, Miriam Valverde on Tuesday, January 30th, 2018 at 11:50 p.m.
"This is our new American moment," Trump said. "There has never been a better time to start living the American Dream." The economy took center stage in Trump’s speech, with mixed accuracy. Trump touted record lows for unemployment levels, middle class relief from the passage of a $1.5 trillion tax cut, and loyalty to his campaign promise to cut red tape. He also made exaggerated claims on ISIS and immigration. Trump’s statements cycled through every Truth-O-Meter rating, except for Pants on Fire. We tallied two False statements, four Mostly False, two Half True, three Mostly True, and one True. "Just as I promised the American people from this podium 11 months ago, we enacted the biggest tax cuts and reforms in American history." It is False that the tax-cut package passed in December is the largest cut ever, as Trump has repeatedly claimed. 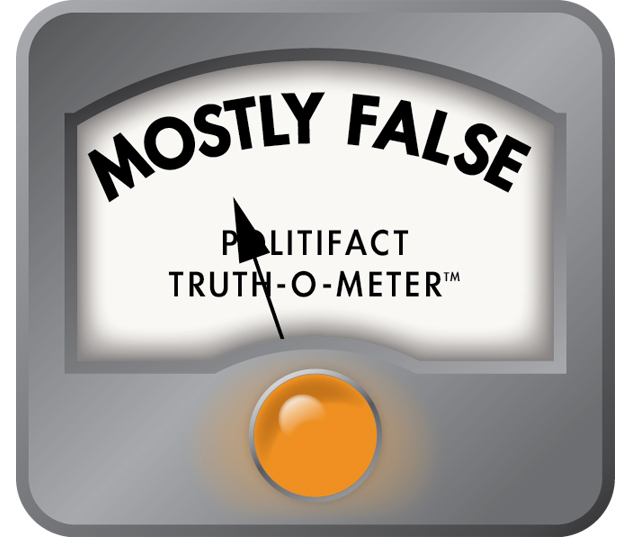 We rated Trump’s claim Mostly False. By the most common measure, wages did go up for the first three quarters of Trump’s presidency, but they fell in the fourth, wiping out all the gains on his watch and then some. His assertion also ignores that wages — by two different measurements — began their climb during the final years of Obama’s presidency. "Our massive tax cuts provide tremendous relief for the middle class and small businesses." The tax bill does benefit Americans with modest incomes initially, but the wealthy take a disproportionate share. Every income group will pay less in taxes in 2019. But the benefits of the tax bill would flow disproportionately to wealthier taxpayers. As some tax breaks expire, lower- or middle-income taxpayers stand to see their gains from the bill evaporate. In all but the top income group, many more taxpayers will see a cut in 2018 than will see one in 2027. We rated that claim Mostly True. Americans for Tax Reform, a group that supported the tax reform bill, found that at least 3 million Americans are receiving bonuses that the companies said were related to passage of the tax bill, based on company press releases and news reports. Economists and labor experts say it will take years to fully assess the economic impact of the tax bill. In this tight labor market, it’s possible that some businesses were already planning to give out bonuses or other financial incentives to retain workers. "The third pillar ends the visa lottery — a program that randomly hands out green cards without any regard for skill, merit, or the safety of American people." We rated Trump’s claim False. While lottery applicants are randomly selected, they must meet education and work experience requirements. They must also be vetted by the United States government before being allowed to come to the United States. Says the visa lottery "randomly hands out green cards without any regard for skill, merit, or the safety of our people." "Under the current broken system, a single immigrant can bring in virtually unlimited numbers of distant relatives." We rated this claim Mostly False. Neither U.S. citizens nor lawful permanent residents can directly petition for a distant relative -- like an aunt, uncle, cousin, niece, nephew, in-law relative or grandparent -- to come to the United States. An immigrant who becomes a U.S. citizen could theoretically petition a parent, and that parent could eventually become a U.S. citizen and petition his or her siblings. But there is a long queue for certain relatives seeking to come through family sponsorship. For brothers and sisters of U.S. citizens, the waiting period for a visa is over 13 years. Green card holders can sponsor a spouse and unmarried children, including unmarried sons and daughters over 21 years old. For U.S. citizens, the categories expand to include parents, married children, brothers and sisters. We rated this statement Mostly False. Trump overstated the number of prisoners released from Guantanamo, who were confirmed to have re-engaged in some type of terrorist activity. That number is 122, not "hundreds and hundreds." He is also not entirely right that al-Baghdadi was "released" by the United States. The ISIS leader was handed over to the Iraqis in 2004. The Iraqis released him some time later. A legal contract between the United States and Iraq guaranteed that the United States would give up custody of virtually every detainee; it was signed during the Bush administration. It would have required an extraordinary effort to have held on to Baghdadi. "One year later, I am proud to report that the coalition to defeat ISIS has liberated very close to 100 percent of the territory just recently held by these killers in Iraq and Syria." We rated Trump’s claim Mostly True. According to data from IHS Markit, a private defense and security research firm, the area controlled by the Islamic State shrunk by 93 percent since January 2015. That’s pretty close to 100 percent. But Trump’s words link the most recent gains too closely to actions taken during his time in office. The area controlled by the Islamic State shrunk by 89 percent during his tenure. The success also built upon strategy and attacks launched under Obama. "We built the Empire State Building in just one year – isn’t it a disgrace that it can now take 10 years just to get a permit approved for a simple road?" 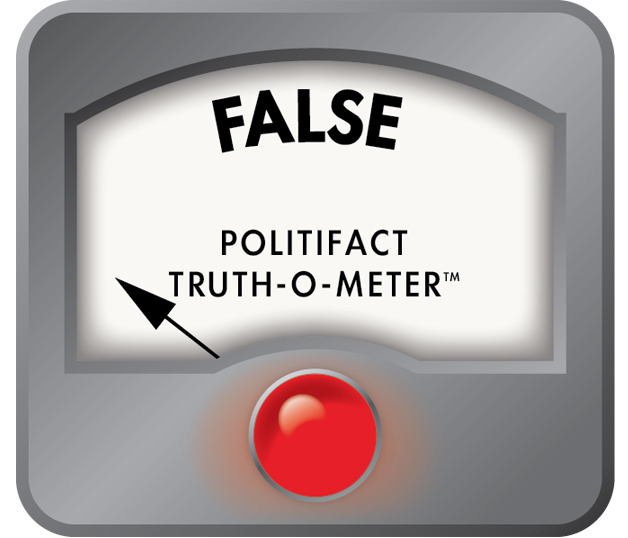 We rated Trump’s claim Half True. The Empire State Building was constructed in one year and 45 days, a little longer than Trump said. He's off base when he said that permitting takes 10 years. Recent government studies say the permit approval time ranges from 4.6 to 6.6 years. The only study we found that claims a 10-year approval is common comes from an anti-regulation group, which raises questions about its reliability. "Chrysler is moving a major plant from Mexico to Michigan." Moving isn’t the right word here. We rated Trump’s earlier claim that "Chrysler is leaving Mexico and moving back to Michigan" Half True. Chrysler does plan to spend $1 billion to shift production of Ram trucks from Saltillo, Mexico, to Warren, Mich. in 2020. But the Mexican plant will start making another kind of vehicle, and the company expects no change in the number of workers there. "We have ended the war on American Energy and we have ended the war on beautiful clean coal. We are now, very proudly, an exporter of energy to the world." We rated this claim Mostly False. The United States remains a net energy importer, a situation that’s not expected to change until midway through the next decade. When it comes to individual energy sources, the U.S. status as a net exporter of coal and refined petroleum products predates Trump. We rated this claim Half True. Apple indeed plans to hire another 20,000 workers in the next five years, but the majority of the $350 billion will go towards the cost of doing business, not new investment. After deducting the costs of paying suppliers and paying taxes, Charles Lee, an accounting professor at Stanford University’s Graduate School of Business, estimated the investment at no more than $37 billion. And based on Apple’s press release, it could be $34 billion. "African-American unemployment stands at the lowest rate ever recorded, and Hispanic American unemployment has also reached the lowest levels in history. The black unemployment rate is indeed at record lows, and the Hispanic unemployment rate reached the lowest levels in history during Trump’s tenure. That’s a continuation of an earlier trend. Under former President Barack Obama, the unemployment rate for both groups fell by more than half. However, economists are skeptical about the ability of presidents to take either credit or blame for conditions on their watch, because many other factors play into economic results. This is True. The National Federation of Independent Business’s small business optimism index for 2017 beat out the previous record, set in 2004. "We slashed the business tax rate from 35 percent all the way down to 21 percent, so American companies can compete and win against anyone in the world. These changes alone are estimated to increase average family income by more than $4,000." We heard skepticism, however, from several economists whose work is cited in the council’s paper. For instance, Dhammika Dharmapala, a tax specialist at the University of Chicago Law School, told PolitiFact that the $4,000 figure "is well outside that suggested by the scholarly consensus." Among the concerns cited were that companies may not leave as much of the benefits for their workers as the study assumes; that it would take years to harvest gains of that size; that its gains may flow disproportionately to richer Americans; and that the $4,000 figure doesn’t account for tax increases in the bill that could eat into that gain. "We have eliminated more regulations in our first year than any administration in the history of our country." Trump has a point here, but it's not the whole story. Trump’s use of the Congressional Review Act to roll back regulations did set a record in his first year. Trump had signed 15 Congressional Review Act measures compared with one previously. But experts have told us that other presidents signed laws that cut more rules than Trump. Examples include the Paperwork Reduction Act of 1995, Regulatory Flexibility Act of 1980, and the Unfunded Mandates Reform Act of 1995, as well as President Jimmy Carter and Ronald Reagan’s deregulation of such previously heavily regulated industries as air travel, trucking, banking and telecommunications. "Last month, I also took an action endorsed unanimously by the U.S. Senate just months before: I recognized Jerusalem as the capital of Israel." We rated a similar claim about the Senate's position on the embassy as Mostly True. The Senate reaffirmed the Jerusalem Embassy Act by a unanimous vote six months ago. However, it’s worth noting that the 2017 Senate resolution also reaffirmed that "the permanent status of Jerusalem remains a matter to be decided between the parties through final status negotiations towards a two-state solution" -- a position that Trump rhetorically backed in his speech, but that some believe could be endangered by his decision to recognize Jerusalem as Israel’s capital and move the embassy. "As we rebuild America’s strength and confidence at home, we are also restoring our strength and standing abroad." There are several surveys of residents of different countries tracking how they feel about the United States. And rather than showing that the United States’ standing abroad is rising, they show that it has declined since Trump took office. • June 2017: An annual report by the Pew Research Center found that across 37 countries, the image of the United States improved by a large margin only in Russia. "Elsewhere, attitudes have taken a dramatic turn for the worse, especially in Western Europe and Latin America," the report said. The international median favorable view of the United States was 49 percent -- "a considerable drop from the median of 64 percent recorded across the same countries in the final years of the Obama administration." • November 2017: In what the pollster GfK called a "substantial drop," the United States was the only one of 50 countries studied to see its "nation brand" rating drop, and it fell from first in the rankings in 2016 to sixth in 2017. Simon Anholt, who created the study in 2005, pointed to a "‘Trump effect,’ following President Trump’s focused political message of ‘America First." "
• January 2018: In an annual survey of how U.S. leadership is seen around the world, Gallup found that global approval was just 30 percent — lower than its previous lows under former President George W. Bush. "It may be too early in Trump’s presidency to tell if his ‘America First’ foreign policy is a success or failure, but this report reveals U.S. alliances and partnerships are at risk," the study says. • January 2018: The 2018 Edelman Trust Barometer found that trust in the United States among 28 foreign countries surveyed "has suffered the largest-ever-recorded drop in the survey’s history among the general population" and an even larger drop among respondents considered by the pollsters to be especially well-informed. "The collapse of trust in the U.S. is driven by a staggering lack of faith in government," the report says. It added, "It is no exaggeration to state that the U.S. has reached a point of crisis that should provoke every leader, in government, business, or civil sector, into urgent action." "The United States is a compassionate nation. We are proud that we do more than any other country to help the needy, the struggling, and the underprivileged all over the world." According to the Organization for Economic Cooperation and Development, the United States leads the pack of advanced, industrialized countries when measured by dollars spent on foreign aid -- almost $34 billion, easily outpacing the second-ranking country, Germany. However, not coincidentally, the United States is also the world’s largest economy. To separate out that factor, the OECD also looks at foreign aid as a percentage of the donor’s economy, and on this score, the United States doesn’t rank nearly as high. On this measure, the United States trails, in order, the United Arab Emirates, Norway, Luxembourg, Sweden, Turkey, Denmark, the United Kingdom, Germany, the Netherlands, Belgium, Switzerland, Finland, Austria, France, and Spain.